NOAH HAD A GREAT IDEA. SO, THIS IS NOW OUR RUBICON. An anti-poaching ranger stands watch, with a giraffe, in the Ol Pejeta Conservancy, north of Nairobi, Kenya. Image courtesy of Dai Kurokawa/EPA. Wildlife is the only sustainable treasure that Nature gave the people of Africa and Asia. This is their asset but we are all responsible for it because it is also their gift to the world. The rest are just economies from the extraction of minerals and agriculture off the natural land. If both continent’s iconic wildlife fails, the rest of the world will follow. We regard it as a sacred mission to abolish the evil commerce of wildlife trade and exploitation for it continues to rob the world of its treasures and people. To that end, we support all types of development programs that will enable sustainable communities out of poverty and insecurity so that local people would choose a vibrant wildlife economy over a violent extinction economy. We are not pulling any punches with these grim statistics along with these images. They will hurt a bit. But, that is precisely the point. They must hurt, to compel you to act. An elephant hacked to death by wildlife terrorists in the DRC on 06/13/2014. Image courtesy of Bouba Njida. Wildlife Trafficking, which includes elephants and its body parts, generates an income of approximately US $10 billion / UK £7.6 billion / EUR €8.6 billion to illicit criminal enterprises around the world. Ivory can command prices as high as US $3,000 / UK £2,294 / EUR €2,548 a pound. Poachers, funded by terrorists, killed 100,000 elephants during the past three years. There were 3 to 5 million African elephants in the 1930s and 1940s and are around 350,000 in the wild now. Elephants are killed 96 a day, 672 a week, 2,688 a month, and 32,256 a year. In 2003, Chad’s Zakouma National Park was home to an estimated 4,300 elephants. Today that number is fewer than 500. In January 2012, 650 elephants were slaughtered in Bouba Njida National Park in Cameroon by Chadian terrorists. Poachers in Africa have increasingly turned to using poisoned arrows and cyanide poisoning to killing elephants because gunshots betray their locations. Farmers and poachers in Indonesia use the barbaric practice of putting poison on soap bars and sticking them to tree branches, knowing that elephants will eat them. Poachers has been proven to be affiliated with terrorists groups, or are terrorists themselves, with the killing of wildlife for their body parts enablimg the killing of innocent people. Garamba National Park in the DRC is the hottest spot of elephant poaching, in Africa, with 68 elephants killed there in 2 months (2014). African poaching occurs daily, especially in Angola, CAR (62% decline), Congo, DRC, Mozambique (Niassa, 50% decline), Sudan, Tanzania (Selous, 60% decline), Zambia (Luangwa Valley), and Zimbabwe are where elephants are most threatened, as of today. Elephants population in Tanzania alone, from 2009 to 2014, dropped from 109,051 to 43,330 and 45 tonnes of ivory has been exported to the illegal black market from Dar-es-Salaam as one of three major ports of trafficking. Mombasa (Kenya) and Addis Ababa (Ethiopia) are the other two major ports of ivory and wildlife parts trafficking from Africa to the world. The better areas for African elephants are in Botswana, Gabon, Namibia, and Uganda but there have still been cases of poaching reported. Asian elephant poaching has been reported in Periyar National Park in India. New reports from Sri Lanka and Myanmar indicate that Asian elephants are now being killed for their skin, regardless of tusk growth, by poachers in cahoots with Chinese criminal kingpins. Ivory stockpiles has been destroyed by Belgium, Chad, China, Congo, Ethiopia, France, Gabon, Hong Kong, Kenya, Malawi, Sri Lanka, The Philippines, UAE, and the USA, as of today. Elephants are now extinct in Burundi, Gambia, and Mauritania. Trophy hunting is legal in Botswana, Cameroon, Gabon, Mozambique, Namibia, South Africa, Tanzania, Zambia, and Zimbabwe. African (Angola, Benin, Botswana, Burkina Faso, Cameroon, Central African Republic, Chad, Congo, Democratic Republic of Congo, Côte d’Ivoire, Equatorial Guinea, Eritrea, Ethiopia, Gabon, Ghana, Guinea, Guinea-Bissau, Kenya, Liberia, Malawi, Mali, Mozambique, Namibia, Niger, Nigeria, Rwanda, Senegal, Sierra Leone, Somalia, South Africa, South Sudan, Tanzania, Togo, Uganda, Zambia, and Zimbabwe) have larger ears, concave back, more wrinkled skin, a sloping abdomen, and two finger-like extensions at the tip of their trunk. They are the biggest among its species, feeds on high foliage as browsers. The total number for African elephants in the wild is estimated at under 350,000. Savannah or Bush (Angola, Botswana, Central African Republic, Chad, Congo, Democratic Republic of the Congo, Eritrea, Ethiopia, Kenya, Malawi, Mozambique, Rwanda, Somalia, South Africa, Tanzania, Uganda, Zambia, and Zimbabwe) may be found in dry savannahs, deserts, marshes, lake shores, and in some mountain elevations. No exact count has been recorded due to fragmented migratory patterns. Desert (Namibia and Mali) are the rarest of all African sub-species with a count of 600 and classified as critically endangered; are usually found in the Namib and Sahara deserts. Forest (Benin, Burkina Faso, Cameroon, Central African Republic, Chad, Congo, Democratic Republic of the Congo, Côte d’Ivoire, Equatorial Guinea, Ghana, Guinea, Guinea Bissau, Mali, Niger, Nigeria, Senegal, Sierra Leone and Togo) mainly live in equatorial forests but will enter areas between forests and the savannah. The estimated count for African forest elephants are 70,000. Asian elephant (Bangladesh, Bhutan, Cambodia, China, India, Indonesia, Laos, Malaysia, Myanmar, Nepal, Sri Lanka, Thailand, and Vietnam) with total global population at less than 50,000 in the wild has smaller ears, a convex back, smoother skin, a horizontal abdomen, dorsal bumps on its head, some patches of de-pigmentation, and one finger-like extension at the tip of their trunk. They are mainly grazers and feed on low ground. Indian (Bangladesh, Bhutan, China, India, and formerly Pakistan) are numbered at around at less than 30,000 and is now extinct in Pakistan. Sri Lankan (N, S, E, NW, NC and SE Sri Lanka) with recorded numbers at 2,500–4,000. Sumatran (Indonesia and Malaysia) are numbered at around 4,500–6,000. During the past few years, they have been abused, tortured, and murdered daily by farmers and poachers in East Aceh, Aceh Jayah, and Riau. Borneo (Indonesia and Sabah, Malaysia) are sporadic with recorded numbers at 4,500–6,500. Aside from poaching and human violence, all elephants are also threatened by exploitation (captured for entertainment, work, and zoos) and habitat destruction due to deforestation, development, and farming (scale rubber, timber, paper pulp, and palm oil) plantations. Fun Fact: Elephants are a female-dominated species and matriarchs are the leaders of the herd. *All population statistics are based from the current IUCN Red List of Threatened Species, Version 2014.2 of the International Union for Conservation of Nature. 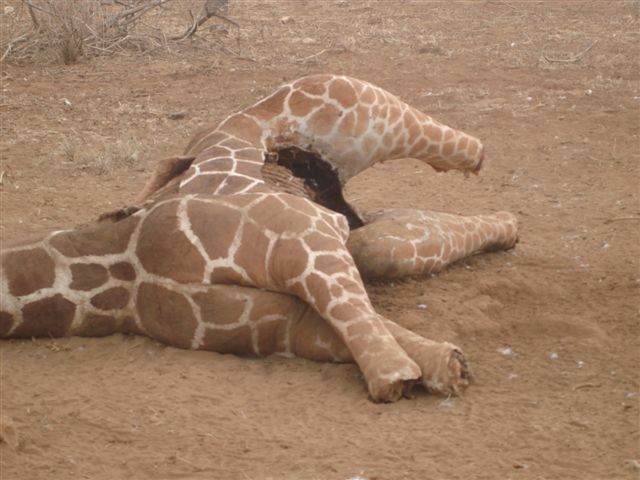 An mutilated giraffe after being poached of its head, hooves, and tail by wildlife terrorists on 09/19/2014. Image courtesy of the African Wildlife Foundation (AWF). Wildlife Trafficking, which includes giraffes and its body parts, generates an income of approximately US $10 billion / UK £7.6 billion / EUR €8.6 billion to illicit criminal enterprises around the world. Pervasive poaching of giraffe has been reported in the Democratic Republic of Congo, Kenya, and Tanzania with heads and bones are believed to be sold for US $140 / UK £107 / EUR €118 each. Bush meat also provides an substantial source of income for impoverished rural communities in rural Africa. Giraffes are poached for their brains and bone marrow, sold as fake cure for HIV/AIDS and cancer in China and Vietnam by smugglers. Giraffe tails are poached to make bracelets, necklaces, and other jewelry. In Tanzania and the Congo, giraffes are killed by wildlife terrorists for food and black market while poaching for elephants and rhinos, making poaching a triple-threat to three species at the same time. Illegal hunting, habitat destruction and the spread of human agriculture have similarly caused populations of Rothschild’s giraffe (Giraffa camelopardalis rothschildii), found mostly in Uganda and Kenya, to drop from as many as 2,500 individuals in the 1960s to around 500 between 2006 and 2009. Giraffes suffer as a result of indiscriminate killing for ivory; an easy kill for wildlife terrorists with rifles or by steel-wire snares, which also kill other wildlife that walks by. Twelve giraffes were killed in one area called Naiti (Arusha Province, Tanzania) in one day on September 2004. There were 140,000 giraffes in 1999 and now their numbers are down 80% to fewer than 70,000. The better areas for giraffes are in Botswana, Namibia, South Africa, and Zimbabwe but there had been cases of poaching reported. The giraffe is the national animal of Tanzania and is protected by law with imprisonment. Giraffes are now extinct in Angola, Eritrea, Guinea, Mali, Mauritania, Nigeria, and Senegal but reintroduced in Rwanda and the Swaziland. Angolan/Namibian (N Namibia, SW Zambia, Botswana, and W Zimbabwe) are estimated to be under 20,000 in the wild. Kordofan (S Chad, CAR, N Cameroon, NE DRC) are fewer than 3,000 in the wild. Masai/Kilimanjaro (SE Kenya, Tanzania) are estimated to be less than 40,000 in the wild. Nubian (E South Sudan, SW Ethiopia) are only 250 or less in the wild and classified as vulnerable. Reticulated/Somali (NE Kenya, S Ethiopia, Somalia) are estimated at 5,000 or fewer in the wild. Rhodesian/Thornicroft (Luangwa Valley in E Zambia) are fewer than 1,500 remain in the wild. Rothschild’s/Baringo/Ugandan (Kenya, S Sudan, Uganda) has fewer than 700 in the wild and are now endangered. South African (S Botswana, SW Mozambique, S South Africa, S Zimbabwe) are estimated to be under than 12,000 in the wild. West African/Niger/Nigerian (Cameroon, SW Niger) are the rarest sub-species with less than 220 remaining in the wild and classified as endangered. Aside from poaching, poverty, and food insecurity, the “silent extinction” of giraffes is exacerbated by habitat destruction due to deforestation, development, and farming. In addition to giraffes, we also focus on their genetic cousins called the Okapi—an endangered species that resembles a horse with zebra stripes on its hind legs. The Okapi primarily roam in the Congo, particularly in the Ituri forest. Okapi numbers are in dire straits, which has plummeted tremendously: From 40,000 in 2001 to only just 10,000 in 2013, according to the comprehensive study done by the Okapi Conservation Project in the Congo. Fun Fact: Every giraffe has its own unique pattern of “spots” which help members of family groups recognize each other. *All population statistics are based from the current IUCN Red List of Threatened Species, Version 2012.2 of the International Union for Conservation of Nature. Another casualty of wildlife terrorism, an African white rhino, in Kenya on 10/11/2011. Image courtesy of Claus Mortenson. Wildlife Trafficking, which includes rhinos and its body parts, generates an income of approximately US $10 billion / UK £7.6 billion / EUR €8.6 billion to illicit criminal enterprises around the world. Rhino horns can fetch up to US $60,000 / UK £45,896 / EUR €50,979 per kilogram (2.2 pounds) and is in high demand in China, Thailand, and Vietnam as a fake cure for many types of diseases. Rhino poaching has increased to an unsustainable rate of 9,246 percent since 2007. In 2007, only 13 rhinos were killed in South Africa. In 2013, poaching increased to 1,004. In 2014, it rose to 1,200. In 2015, poaching stats numbered at 1,500-plus. Three rhinos are killed daily by poachers whose profits fund terrorists. 13 black rhinos were killed in Kruger National Park, South Africa in one day alone on 05/11/15. Rhino poaching in South Africa is up 62% from 2014 on the same date of 05/11/15 with 393 killed with 73% of that killed in Kruger National Park (KNP). KNP is home to the largest population of rhinos in Africa and shares a porous border with Mozambique where most wildlife terrorists, and some corrupt Mozambican park rangers, come from to kill KNP’s rhinos with 72 known cross-border armed incursions (2013). African-wide, rhino poaching is up 18% with 1,215 killed from 2014. Rhinos are usually killed by poachers while they drink since they visit waterholes frequently. There are new reports from South Africa that poaching gangs now kill rhino calves to entice rhino mothers to come to their and then kill them for their horns, as of August 2017. White rhinoceros (Africa) has large head, short neck, and broad chest. They are actually grey and has wide square lips is now extinct in their native location. Northern White (formerly in the Chad, Cameroon, Central African Republic, Democratic Republic of Congo, South Sudan, and Uganda) is extinct. The last 4 remaining in captivity (in the Czech Republic) were relocated in the Ol Pejeta Conservancy (Kenya) to naturally breed under a 24/7 protection. Southern White (Kenya, Namibia, South Africa, Uganda, and Zimbabwe) rhinos are only 20,405 left in the wild. Black rhinos (African) are smaller than white rhinos with pointed mouths, and also grey in color. North-eastern (Djibouti, Eritrea, Ethiopia, Somalia, and C Sudan) is now extinct. Chobe (SE Angola, N Botswana, and Namibia) is considered extinct but with 1 rhino reported sighting in Botswana. South-central (Mozambique, NE South Africa, C Tanzania, Zambia, Zimbabwe) are actually grayish in color also and are hooked-lip and are considered extinct in native locations but re-introduced in Botswana, Malawi, and Zambia. South-western (S Angola, W Botswana, Cameroon, Namibia, and W South Africa) are more adapted to arid and semi-arid climates. Their numbers are few in reserves in Namibia and sporadic sightings in S Angola. Southern Black or “Cape” rhinos (S Namibia, S South Africa) were the largest of all sub-species and is now extinct since the 1850s. East African (formerly S Sudan, Ethiopia, and Kenya) and now considered in existence in Tanzania only. Uganda (formerly of S Sudan and Uganda) is considered extinct with unconfirmed reports of possible sighting in Kenya. West African (formerly in N Cameroon, N Central African Republic, S Chad, SE Niger, NE Nigeria, and S Sudan) is now extinct since 2011. Indian rhinoceros or “greater one-horned rhinoceros” (Burma, India, Pakistan, and formerly in China) are listed as critically endangered with 3,555 in the wild (according to a 2015 count) and has one single horn and as nearly as large as the African white rhino with wart-like bumps on their upper legs and shoulders. In India, they are protected in Assam, West Bengal, and Uttar Pradesh with 2/3 of all species located in the Kaziranga National Park in Assam. In Nepal, they are confined to the tall grasslands and forests in the foothills of the Himalayas. In Pakistan, they are protected in Lal Suhanra National Park. Javan rhinoceros (Indonesia and formerly in Vietnam) and is characterized by their armored appearance with one horn. It is the least known of all species. There are only 40 (or less, according to a 2014 count) Javan rhinos exist in the world, located in Ujung Kulon Conservation in Java, Indonesia, and listed as critically endangered. The last Javan rhino in Vietnam was killed in 2010. Sumatran rhinoceros (Borneo and Sumatra) are the smallest of all sub-species, hairy, stubby legs, and short; and may be found in the high altitudes of their environment, with a count of only 275 believed to be in parts of Indonesia and Malaysia; and listed as critically endangered. Aside from poaching and human violence, all rhinos are also threatened by habitat destruction due to deforestation, development, and farming. Legends in Burma, India, and Malaysia has it that rhinos were known to stamp out forest fires in that part of the world. Rhinos has been around for 40 million years, but now fewer than 30,000 remain. Fun Fact: Rhinos use their square chins to dig the ground for food. South African wildlife park rangers investigating a poached rhino on 04/08/2013 in Kruger National Park, South Africa, bordering Mozambique. Image courtesy of Cornel Van Heerden. 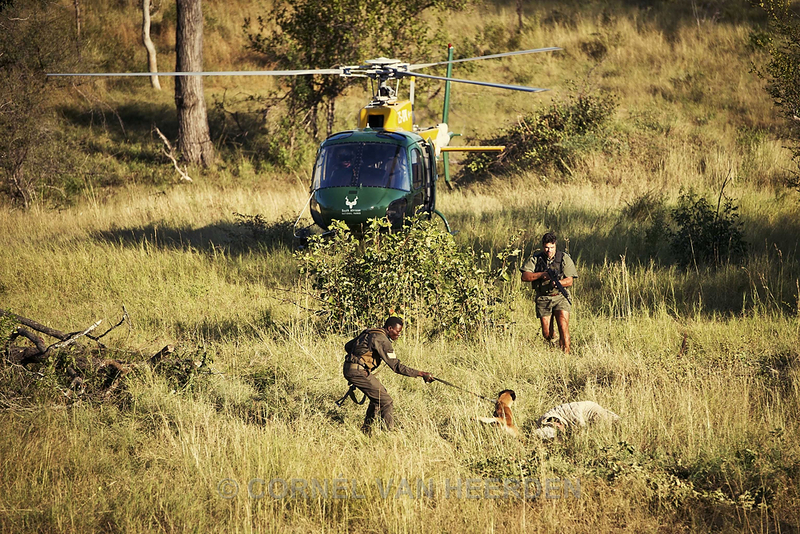 The wildlife park rangers deployed worldwide are the only true defenders of wildlife. They are dedicated and motivated only by their love for the world’s iconic species. On average, a park ranger only gets paid an average of USD $125 / UK £95 / EUR €106 a month while risking their lives. A single wildlife park ranger cover an average of 53 square miles per each and responsible for more than 10 species of wildlife at any given time. During the past decade alone, more than 1,000 rangers have been killed in the line of duty, at the rate of 1 ranger killed in action (KIA) every 4 days. Every month, dedicated rangers cover thousands of kilometers through dense rain forest risking their lives on patrol. These men and women work to protect wildlife by removing snares and traps, arresting poachers, and removing illegal miners from the region. In 2016 for example, rangers covered 14,200 kilometers and removed 2,200 snares from the forest, preventing the death of okapi and other species for bush meat in the Congo. Poaching significantly increases during the holiday season, making this the ideal time to increase protection efforts and support the rangers patrolling wildlife reserves. They are far underpaid, overworked, and are out-resourced by well-equipped experienced and militarized poachers, who are funded by international crime cartels. Proceeds of profits from the Bloody Ivory Trade also go to terrorist organizations, especially in Africa and eventually to the Middle East. With 183 Chinese mafia or “Triad” groups (in 11 countries) doing the selling and distribution of wildlife parts from Africa, a substantial portion of these illegal profits are ending up in the hands of terrorist organizations and their affiliates; supplying arms and resources back to poachers. So long as there is any value on wildlife parts, the proceeds end up in the hands of Da’esh (Islamic State) and al-Qa’eda through their affiliates in Africa, among others. Confirmed and suspected terrorists organizations that are involved in poaching activities include many names that you might be familiar with and many that you are not. They include al-Hijra (Muslim Youth Center/MYC, Kenya), Allied Democratic Forces—National Army of the Liberation of Uganda (ADF-NALU), al-Qa’eda in the Islamic Maghreb (Algeria, Mali, and Mauritania), al-Shabaab (Kenya and Somalia), Ansar Dine (Mali, Senegal, and Mauritania), Ansarul Bangladesh Team (ABT, Bangladesh), Bangladesh Nationalist Party (BNP), Boko Haram/Da’esh West Africa Province (DWAP, Cameroon and Nigeria), Forces armées du peuple congolais—FAPC (The People’s Armed Forces of Congo), Forces de resistance patriotiques en Ituri—FRPI (Patriotic Resistance Front in Ituri, Congo), Forces démocratiques de libération du Rwanda—FDLR (Democratic Forces for the Liberation of Rwanda), Forces patriotiques pour la libération du Congo—FPLC (Patriotic Forces for the Liberation of Congo), Forces populaires pour la democratie au Congo—FPDC (Popular Force for Democracy in Congo), Front populaire pour la justice au Congo—FPJC (Popular Front for Justice in Congo), Jamat-e-Islami (JI, Bangladesh), Jamaatul Mujahaideen Bangladesh (JBM, Da’esh affiliate), Janjaweed (Western Sudan/Eastern Chad), Karbi People’s Liberation Tigers (KPLT, India), L’Union des patriotes congolais—UPC (Union of Congolese Patriots, Congo), Le Front des nationalistes et intégrationnistes—FNI (Nationalist Integrationist Front, Congo), Le Parti pour l’unité et la sauvegarde de l’intégrité du Congo—PUSIC (Party for Unity and Safeguarding of the Integrity of Congo), Lord’s Resistance Army / Lord’s Resistance Movement (LRA/LRM, Uganda and Nigeria), Mai-Mai Raia Mutomboki (Congo Region), Mombasa Republican Council (MRC, Kenya and Somalia), Pwani Democratic Movement (PDM, Kenya and Somalia), and the Séléka (CAR, Chad, and the Sudan). Since wildlife park rangers are law enforcement officers commissioned by their legal charters, their rules of engagement (ROE) do not allow them to “shoot first” when they encounter a poacher. In other words, they are fighting a military operation but are only allowed to shoot in self defense, thereby putting themselves more at risk. The limited ROE of park rangers also result in many wildlife casualties after they happen and apprehensions only happen after the fact making deterrence an impossible job. Botswana, India, and Tanzania are the only countries that has a military mandate to combat poachers with an offensive posture (lethal ROE) conducted by their military forces, bringing this “war” back to the poachers. South Africa is considering a lethal ROE policy against poachers in 2016. There are 6,000 poachers in Kruger National Park alone, according to the South African National Parks, as reported by the South African government. Over 100 wildlife park rangers have lost their lives in Virunga National Park in the DRC alone, to date. Garamba National Park in the DRC has only 120 rangers covering 4,800 square miles. We call these intrepid warriors The Heroes That Care Forgot™ because they risk their lives on the thin green line to defend the iconic wildlife on the world’s behalf without much protection, recognition, and support. We would like to honor and recognize the following brave wildlife conservationists, rangers, and soldiers who gave the ultimate sacrifice while defending wildlife, since the date of our founding: Mark Lautenbach (MGRFR, 12/18/2018, Madikwe Game Reserve, South Africa), Eric Chardi Chome (KWS, 08/24/2018, Ol Jogi Wildlife Conservancy, Laikipia, Kenya), Respect Mathebula (SANParks, 07/19/2018, Kruger National Park, South Africa), Abdullahi Salisu (NPPS, 07/02/2018, Afaka Forest Reserve, Nigeria), Jimmy Chilepa (ZDPNW/CSL, 05/20/2018, South Luangwa National Park, Zambia), Rachel Masika Baraka Katumwa (ICCN/VNPR, 05/11/2018, Virunga National Park, DRC), Barthelemie Kakule Mulewa, Emmanuel Ila Muranda, Liévin Mumbere Kasumba, Kananwa Sibomana, Karonkayo Jean de Dieu Byamungu, and Théodore Kasereka Prince (ICCN/VNPR, 04/9/2018, Virunga National Park, DRC), Faustin Biriko Nzabakurikiza (ICCN/VNPR, 04/2/2018, Virunga National Park, DRC), Kalinda Mubengwa (ICCN/OCP, 02/17/2018, Erengeti/North-Kivu Province, DRC), Usman A. Yahaya, Chief Park Ranger (NNPS, 02/06/2018, Gashaka Gumti NP, Serti/Taraba State, Nigeria), Dr. Esmond Bradley Martin (STE/KWS, 02/04/2018, Lingata, Nairobi, Kenya), Julius Kior Kulwa (BLF, 02/01/2018, Chyulu National Park, Kenya), Attacher Younoussa (MCAR/MAPB-CW, 11/19/2017, Hombori/Mopti Region, Mali), Ambroce Nyange (KWS, 10/26/2017, Rukinga Ranch/Taita Taveta, Kenya), Adamou Philippe (ICCN, 9/6/2017, Nouabalé-Ndoki NP, DRC), Wayne Lotter (Co-Founder/Director of PAMS Foundation, 8/16/2017, Masaki/Dar es Salaam, Tanzania), Dudunyabo Machongani Célestin (ICCN, 7/16/2017, Virunga NP, DRC), Bwambale Nyamikenge (ICCN, 2/27/2017, Virunga NP, DRC), Kasereka Mwana Zaire (ICCN, 2/27/2017, Virunga NP, DRC), Katu Mumbere (ICCN, 2/27/2017, Virunga NP, DRC), Murigeppa Tammangol (MoEFCC, 2/19/2017, Bandipur NP, India), Rodrick Ngulube (ZAWA, 2/12/2017, West Petauke GMA, Zambia), Shaun Barendsen (NAC/AP, 1/24/2017, Chinko, CAR), David Fine (AP, 1/24/2017, Chinko, CAR), Sous-Lieutenant Mbenga-Nzongomblo Ponce Pilate (AP, 1/24/2017, Chinko, CAR), Patrick Prince Muhayirwa (ICCN, 12/7/2016, Virunga NP, DRC), Bruce Danny Ngongo (MINFOF, 12/10/2016, Lobéké NP, Cameroon), Anthony Twesigye (UWA, 10/19/2016, Murchison Falls Conservation Area, Uganda), Munganga Nzonga Jacques (ICCN, 10/04/2016, Kahuzi-Biéga NP, DRC), Jules Kombi Kambale (ICCN, 9/01/2016, Virunga NP, DRC), Wisani Baloyi (PAPU, 6/16/2016, Limpopo NP, South Africa), Richard Sungudikpio Ndingba (AP, 4/23/2016, Garamba NP, DRC), Rigobert Anigobe Bagale (AP, 4/23/2016, Garamba NP, DRC), Mathieu Gameying (CWFS, 4/01/2016, Faro NP, Cameroon), Dieudonné Tsago Matikuli (AP, 4/23/2016, Garamba NP, DRC), Oscar Byamungu Mianziro (ICCN, 3/31/2016, Kahuzi-Biéga NP, DRC), Brigadier Venant Mubere Muvesevese (ICCN, 3/12/2016, Virunga NP, DRC), Fidèle Mulonga Mulegalega (ICCN, 3/12/2016, Virunga NP, DRC), Aliyu Zakari (NWPS, 3/02/2016, Kainji Lake NP, Nigeria), Captain Roger Gower (FCF, 1/29/2016, Maswa Game Reserve, Tanzania), Sebinye Bavukirahe Yacinthe (ICCN, 1/23/2016, Virunga NP, DRC), Yacente Sebinyenzi (ICCN, 1/21/2016, Virunga NP, DRC), Emily Stephen Kisamo (TANAPA, 12/18/2015, Maragu, Tanzania), Jean Claude Kiza Vunabandi (AP, 11/03/2015, Virunga NP, DRC), Anselme Kimbesa Muhindo (AP, 10/08/2015, Garamba NP, DRC), Andre Gada Migifuloyo (AP, 10/08/2015, Garamba NP, DRC), Djuma Adalu Uweko (AP, 10/08/2015, Garamba NP, DRC), Col. Jacques Sukamate Lusengo (FARDC, 10/08/2015, Garamba NP, DRC), Jean-Marie Kpionyeslinani (AP, 6/19/2015, Garamba NP, DRC), Cpl. Kambale Musabao (FARDC, 6/19/2015, Garamba NP, DRC), Lt. Moise Mospado (FARDC, 6/19/2015, Garamba NP, DRC), Agoyo Mbikoyo (AP, 4/25/2015, Garamba NP, DRC), Dexter Chilunda (AP, 5/23/2015, Liuwa Plain NP, Zambia) and countless others we missed publishing at this time with our regrets.